Canning Jars Lids, Rings, Bands, Wires and Other Fittings: Questions and Answers! Looking for Canning Jars Lids, Rings, Bands, Wires and Other Fittings: Questions and Answers! in 2019? Scroll down this page and follow the links. And if you bring home some fruit or vegetables and want to can, freeze, make jam, salsa or pickles, see this page for simple, reliable, illustrated canning, freezing or preserving directions. There are plenty of other related resources, click on the resources dropdown above. Canning jars lids and rings are unique, fussy things. Consequently, there are many questions people have about canning jar lids, rings, bands, wires and other fittings. Here is a collection of popular and common questions about canning jars lids, rings and attachments. See this page for questions and answers about the canning jars themselves (rather than the lids / rings). This page has a history of the canning jar and this page has free label templates to allow you to make your own custom jar labels. I followed your instructions for canning blueberries (hot pack). I tightened the jars until they were totally closed, and then set them down (on their side) in a pot to process. I had to process them on their side because I didn't have a large enough pot to do otherwise and didn't want to spend the money on one. I noticed after processing each jar and removing it from the pot of boiling water, that the water would become tinged with purple, indicating that some juice had clearly leaked from the jar. Then, when the jar would cool down, I noticed that I could still tighten the lid (even though I had tightened it as far as it would go before I put it in the pot to process). Is this leaking normal? Is it going to be a problem when I go to eat my canned blueberries? Yep; there are two things going on. First, don't overtighten the rings, that can cause the lids to deform and leak. Next, don't lay the jars on their sides. When the contents expand in the hot water, the contents will be pushed out, rather than the air! The jars may not even seal properly. How would you go about using different jars for canning sauce ? In other words, not using mason jars but other jars with screw on lids? Would you go about it the same way or is there a different way? My concern would be the lids and having them sealing properly. Well, the "authorities" all say NEVER use anything but Ball / Kerr and other canning jars. In practice, many home canners find (through practice) that certain products (like Classico brand spaghetti sauce) are packaged in jars that are the same specification as commercial home canning jars. What if the lids on canning jars spring back after canning? Run for the bomb shelter before they explode! Nah, just kidding, it's not that bad. But unfortunately, it does mean that the jars failed to seal correctly. Most likely, the lids weren't seated correctly, often due to spilled contents on the rim of the jar or sealing surface of the lid - OR the contents never got hot enough to create sufficient vacuum when the jars cooled OR the lid's glue was cold. Next time, wipe the top of the jar, use clean new lids, which were kept in barely simmering water and be sure to fil the jars with hot contents and process right away and for the full duration specified in the recipe. If you do get jars which don't seal properly, you can either put the jars in the refrigerator and use them first, or empty them jars back into a pot, heat them up again, re-jar them, put new lids on and process them again...generally, that's too much work, so unless an entire batch fails, I stick the few that fail to seal in the fridge. Is it all right to reuse jar fittings (lids and bands)? 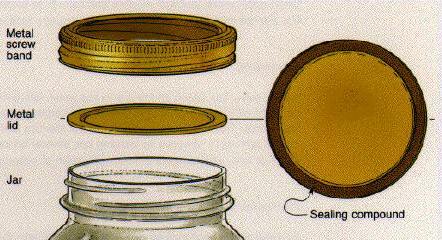 Lids should not be used a second time since the sealing compound becomes indented by the first use, preventing another airtight seal. Screw bands may be reused unless they are badly rusted or the top edge is pried up which would prevent a proper seal. Why do the undersides of metal lids sometimes discolor; such as black spots or uneven coloring on the lid? I've occasionally seen this on my lids, too, but never experienced any illness after eating the contents. The USDA/University of Georgia National Home Preservation Center says natural compounds in some foods, particularly acids, corrode metal and make a dark deposit on the underside of jar lids. The underside of metal lids is protected by an enamel coating. If there are any imperfections in the enamel, e.g., tiny scratches or pinholes, natural compounds in food can react with the metal in the lid to form brown or black deposits. This deposit on lids of sealed, properly processed canned foods is harmless. In addition to the causes listed above, sometimes bits of the canned food adhere to the lid, and dry there, causing a dark spot. What causes lids to buckle? Putting screw bands on so tightly that air can hardly escape from jars during processing. The buildup of pressure inside jars causes lids to buckle. Screw bands should be tightened firmly, by hand. Do not use a jar wrench to tighten screw bands.